I had thought the new place of the day’s name was Juxtapoz because of the large sign over the door, but it turns out that the store is called What? Shoppe and Juxtapoz is an online magazine. 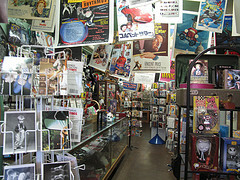 The store is crowded with an interesting assortment of unusual merchandise demanding some serious browsing time. I noticed t-shirts, figurines, wigs, cards, posters, model train stuff and much more. This is a great place to find a present for a hard to please young adult. This entry was posted in Art -- there is art here!, Stores and other places that sell you things, Tacoma, Unique Shopping (stores with some personality), WA State - Pierce County and tagged Antique Row, cards, figurines, Juxtapoz, model trains, posters, retail, store, Tacoma, What? Shoppe on November 30, 2010 by admin.